Oil prices have been persistently low for well over a year and a half now, but as the April 2016 World Economic Outlook will document, the widely anticipated “shot in the arm” for the global economy has yet to materialize. We argue that, paradoxically, global benefits from low prices will likely appear only after prices have recovered somewhat, and advanced economies have made more progress surmounting the current low interest rate environment. Since June 2014 oil prices have dropped about 65 percent in U.S. dollar terms (about $70) as growth has progressively slowed across a broad range of countries. Even taking into account the 20 percent dollar appreciation during this period (in nominal effective terms), the decline in oil prices in local currency has been on average over $60. This outcome has puzzled many observers including us at the Fund, who had believed that oil-price declines would be a net plus for the world economy, obviously hurting exporters but delivering more-than-offsetting gains to importers. The key assumption behind that belief is a specific difference in saving behavior between oil importers and oil exporters: consumers in oil importing regions such as Europe have a higher marginal propensity to consume out of income than those in exporters such as Saudi Arabia. World equity markets have clearly not subscribed to this theory. Over the past six months or more, equity markets have tended to fall when oil prices fall—not what we would expect if lower oil prices help the world economy on balance. 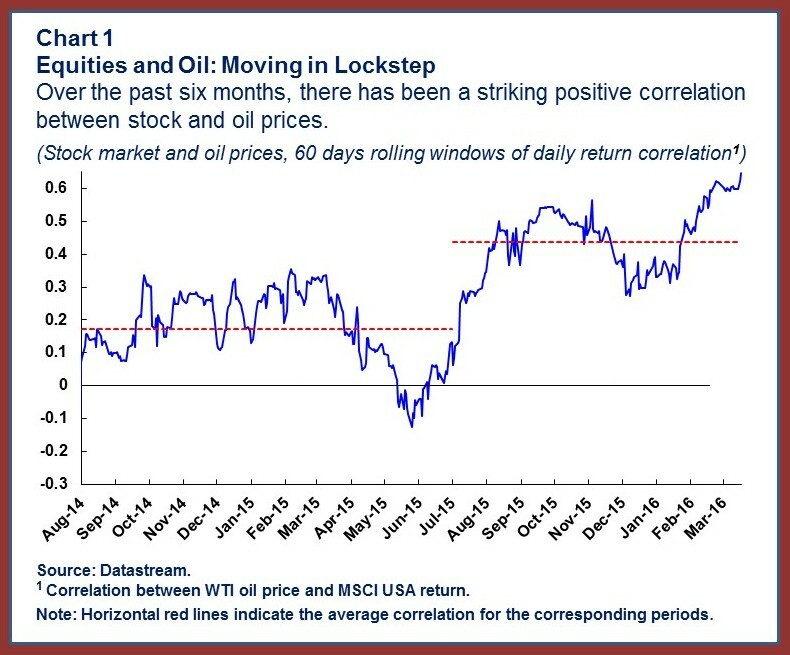 Indeed, since August 2015 the simple correlation between equity and oil prices has not only been positive (Chart 1), it has doubled in comparison to an earlier period starting in August 2014 (though not to an unprecedented level). Past episodes of sharp changes in oil prices have tended to have visible countercyclical effects—for example, slower world growth after big increases. Is this time different? Several factors affect the relation between oil prices and growth, but we will argue that a big difference from previous episodes is that many advanced economies have nominal interest rates at or near zero. 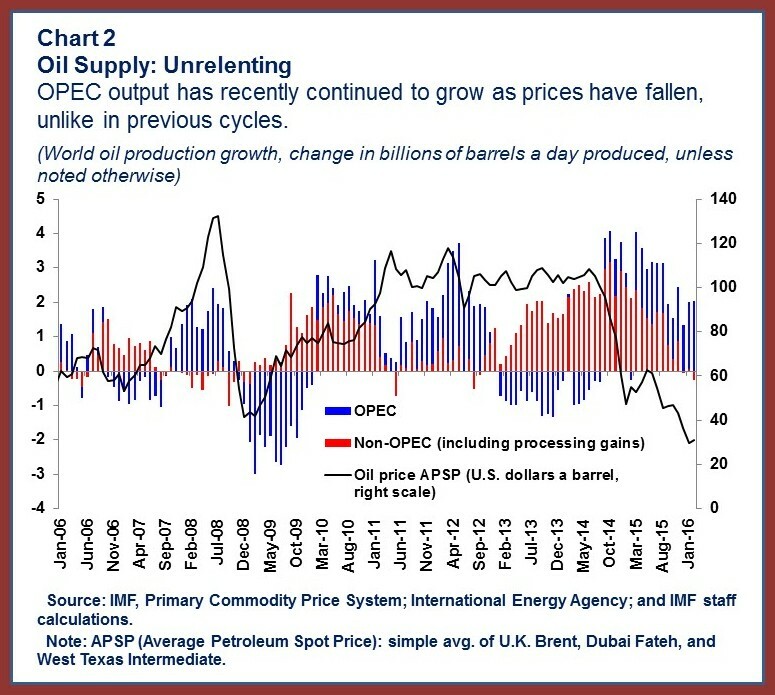 One obvious problem in predicting the effects of oil-price movements is that a fall in the world price can result either from an increase in global supply or a decrease in global demand. But in the latter case, we would expect to see exactly the same pattern as in recent quarters—falling prices accompanied by slowing global growth, with lower oil prices cushioning, but likely not reversing, the growth slowdown. Slowing demand is no doubt part of the story, but the evidence suggests that increased supply is at least as important. More generally, oil supply has been strong owing to record high output from members of the Organization of the Petroleum Exporting Countries (OPEC) including, now, exports from Iran, as well as from some non-OPEC countries. In addition, the U.S. supply of shale oil initially proved surprisingly resilient in the face of lower prices. Chart 2 shows how OPEC output has recently continued to grow as prices have fallen, unlike in some previous cycles.